How to reposition a successful company in a commodity service industry. Unlike most electronics manufacturing service providers, Flextronics offers a complete solution, including design, manufacturing, distribution, and warranty service. Customers can opt for the entire solution or select the components they need most. Either way, Flextronics offers two distinct advantages: fast response and a willingness to adapt to the customer’s needs. 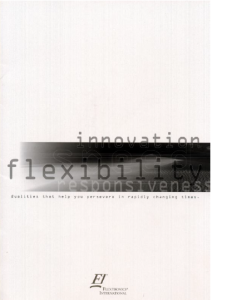 Creative i and Wardog Creative developed a brochure that explains the Flextronics business philosophy/strategy and communicates its benefits to the target audience.